Tom is in Chicago this week so that leaves me at home with the kids. Other than the drama on Monday night, things have been going great. I woke up Tuesday morning in a generous spirit and decided to keep Wilson home from school so that we could spend time together. A friend offered to let us use the warm pool where she works so that we could go swimming there. Wilson, Miller and I arrived ready to swim. I didn’t realize that my friend was planning to give Wilson a swim lesson while we were there. I like that he got a lesson but he was disappointed that he didn’t get to just swim around. Miller and I played in the pool next to him so it was still fun, although he won’t admit it. That night we went over to my friend Stephanie Nance’s house. She has two girls that are 4 and 2. They love playing with my kids and my kids love playing with them. The five of them get along so beautifully. We have never once had an issue with them not getting along. It is so relaxing to be able to go to Stephanie’s house and talk to her while the kids play. We usually leave around dinner time and the kids beg for us to stay for dinner. This time we actually planned for us to stay to eat dinner together (which I loved because Tom was gone and I didn’t have to cook). Jon and Stephanie are very gracious hosts and have an equally relaxing household. She is the only other mom I know that lets the kids ride their bikes in the house and doesn’t worry about the floors. Other than the fact that I am ten years older than she is, we have a lot in common. Today Faith got to skip school and go to the Quail Hollow golf tournament with my Dad, John and Will. They had a blast! They were there for many, many hours eating hamburgers and ice cream and drinking sodas. Faith will do almost anything in order to hang out with Will and John. They are her heroes. I think that they have a new appreciation for her as well. Because today was the ProAm, the kids were able to get many of the pro golfers signatures on their programs and hats. Faith asked Stewart Cink to sign her paper and not only did he sign her paper, but also signed a golf ball and handed it to her! Being a cute girl is already paying off! Will and John were amazed! Hence the new found respect and appreciation. I don’t have any pictures of that since I wasn’t there and my dad still has a flip phone. So far, things are running pretty smoothly around here and I am very thankful. I am trying to keep the kids busy enough so that they don’t realize that Tom isn’t here all week. Poor little Miller has cried for him twice. He is so much more aware of what is going on around here and has really grown much more attached to Tom over these last few months. 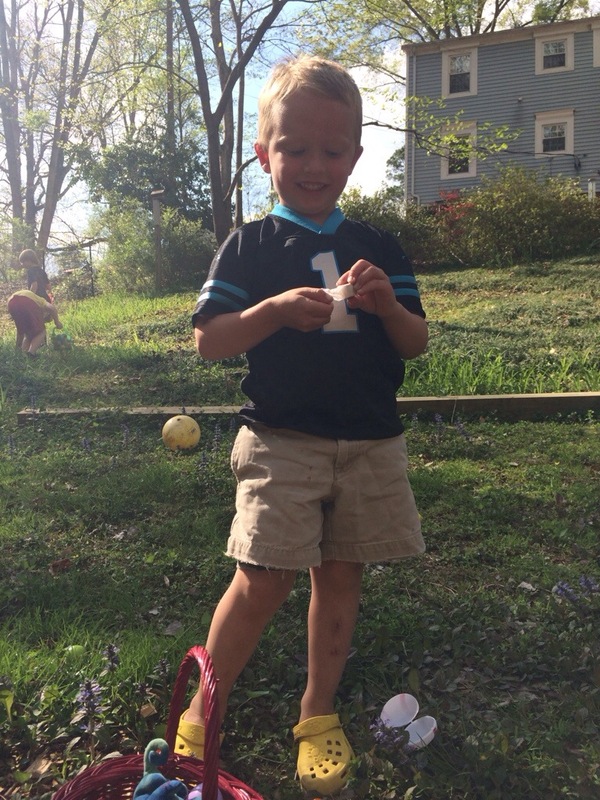 Unfortunately, Tom did miss the big news…Miller peed in the potty today for the first time. 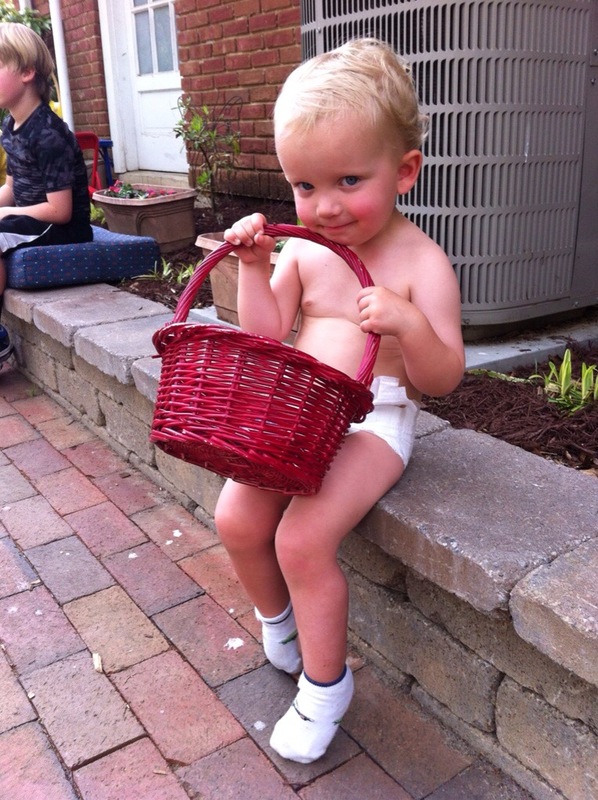 He was naked, as usual, and began to yell, “My pee is coming out!” I scooped him up and we ran to the potty. He sat there a minute and then finally peed. We were all very excited and cheered for him. I think he was pretty proud of himself as well. I am hoping that he will be potty trained by mid-summer. I am so ready to have all of my kids out of diapers (even though diapers are more convenient at time). Well, three days down and two more to go. I think that tomorrow I may start working out again….maybe. This entry was posted in Uncategorized on April 30, 2014 by Becca. I was going to write about our night last night, but thought that writing about a “Day in the Life of Becca” would be more appropriate. You can see exactly how crazy my life is. Today was a busy one and I wanted to write about it before the exhaustion and the humor of it all wore off. To give an accurate picture, I must start the day about an hour after I fell asleep last night…..
Miller woke up at 11:00pm whining and crying for me. I got up, gave him the water that he was asking for, held his hand, and sang him a few songs until he was ready to go to sleep. He did drink the entire water that I gave him so I felt that the whole episode was worth it and a valid reason for him to wake up. At about 4:00am I woke up to find Wilson in between Tom and I, and Faith standing next to me. She was looking to get into bed too. I decided to give her my spot in bed while I walked across the hall and got into Wilson’s empty bed. Honestly, a fabulous decision on my part. It was quiet and I was alone. I was also able to sleep in a bit more since Tom was in bed with the kids who would wake up first. I woke up around 7:30, showered, and quickly got ready for school. I am still teaching preschool on Monday, Wednesday and Friday mornings. I love it, but am ready for school to end…only because I am tired of going somewhere in the mornings. Today I taught eleven two-year-olds for four hours. Fun, but tiring. After work I went to the grocery store because we didn’t have any food in the house. I had been putting off going to the store for over a week. Tom was very gracious not to get completely annoyed with the fact that he had no good food to eat all week. After the store I unpacked the food, set the timer on the oven, and took a twenty minute nap. I set a timer for everything. The oven timer get more use than the oven. The nap was just enough to get me through the day. I woke up to the alarm, packed Faith’s soccer stuff and headed out the door. Then I went to pick up the cousins from school. Will and John were done with school at 3:00pm. I took them to my mom’s and hung out a while until it was time to take Faith to soccer practice. While at mom’s I fed the kids some mac-and-cheese so that they wouldn’t be hungry. I was actually making it part of their very early dinner. Now, here comes the interesting part….. I left mom’s with my three kids. As I was leaving I grabbed the boys’ shoes, Faith’s backpack, an outfit for Miller (because all he had on was a diaper and no proper clothes to wear), and the bag of food to eat at the soccer field. We left a bit early so that I could go to Trader Joe’s while I was on that side of town. As we were pulling into the Trader Joe’s parking lot Wilson announced that he had to go to the bathroom. As usual, I found a spot in the back of the building for me to pull over, open the door, and let him pee right out of the minivan and onto some bushes. As he is peeing I realize that he doesn’t have a shirt on, only pajama pants. Now, anyone that knows Wilson knows that he lives in his pajamas. I usually let him live in them unless he is going to school or church. Of course, in the winter he puts his clothes on OVER his pajamas. Not a battle worth fighting, in my opinion. Who wouldn’t want to wear pajamas all day everyday? I found one of Faith’s soccer jerseys in the back of the car for him to wear. Then Faith tells me that she didn’t have any shoes on! I tell her that she will have to wear her soccer cleats only then realize that I had left the bag with all of her soccer stuff at my mom’s!! I couldn’t believe it. I told Faith that she was going to have to wear Wilson’s shoes at soccer practice with no shin guards. Not ideal, but I was not going to go all the way back to mom’s house when what I really needed was inside of Trader Joe’s. Thankfully, Wilson was okay with the idea of going shoeless at the soccer field. So, I got out of the car, got a shirt on Miller, got shoes on Wilson, and had Faith go into the store with no shoes (I made her sit inside the tiny cart). We were a pathetic bunch. Here is what everyone had on…. I pushed Faith and Miller around in the cart while Wilson hung on to the front. I was zooming around Trader Joe’s like my cart was on fire! People literally moved out of the way as I cut them off and smiled. 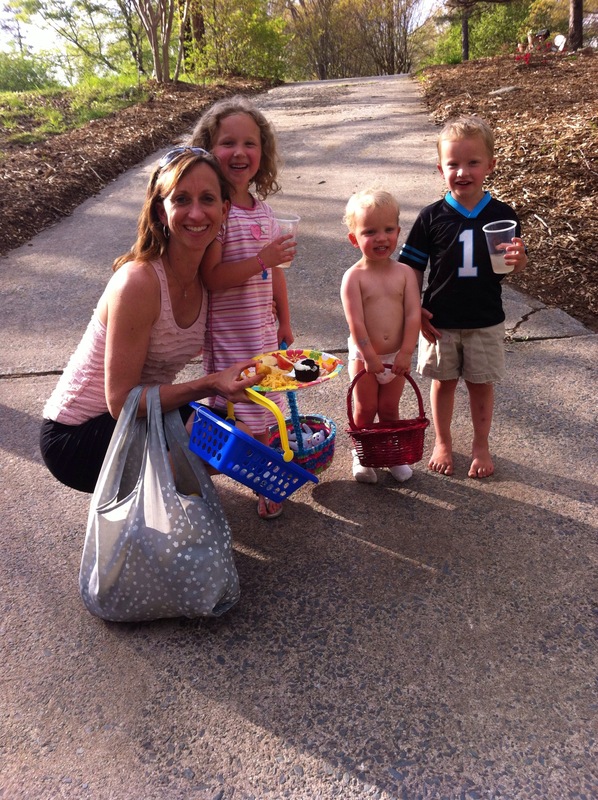 It is too small of a store to have three kids with me – especially ones that looked as raggedy as mine did. The kids behaved wonderfully in the store. I was very thankful for that and praised them for it after we left. I am probably exaggerating on the speed at which I traveled around the store, but I definitely walked fast and took charge of the route that I took. Luckily, Doug met me half way with the bag of Faith’s soccer stuff after we left the store. At the field, my friend laughed and said that if I combined all of the kids’ stuff we would probably have one complete outfit. Yes, this is typically how many of my days go. Part of it is my fault. I should teach the kids a bit more responsibility when it comes to making sure they have all of their stuff. Faith went to church the other night with no shoes as well. You would think that we both would have learned, but we didn’t. I have to laugh and just roll with it many times. Having the wrong shoes, or no shoes, isn’t the end of the world. I am not embarrassed by my children that have on pajamas or only a diaper. I am sure people look at me and think, “Poor thing, she has three young kids…”. I will never see them again and therefore, I don’t worry about it. The thing I try hardest to do is have a good attitude about it all. i have to laugh and just go with it. I can’t change what the current situation is, all I can do is control my attitude. I definitely give them a short lecture, but we move on in style. I finally got all three kids in bed by 8:30pm after a bit of crying and whining….from all of us. Tom is out of town this week and it should be an interesting one. This was just the tip of the iceberg! 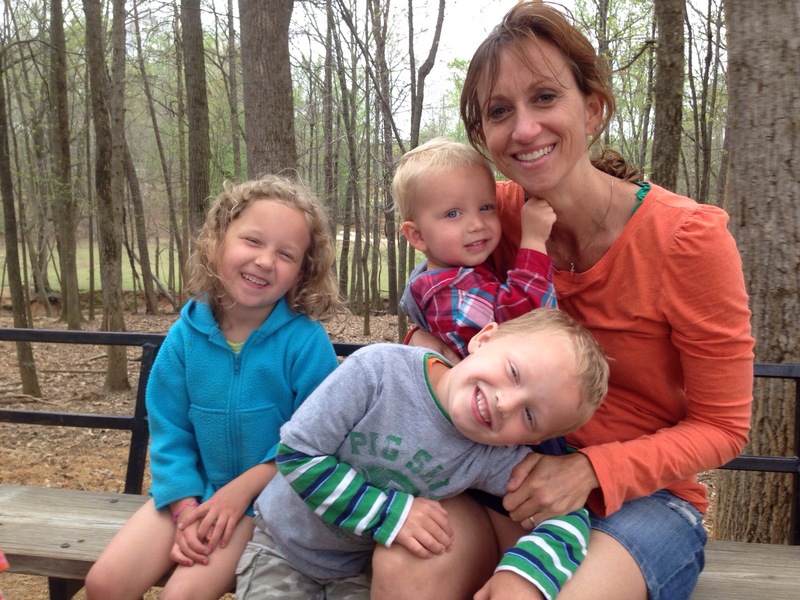 This entry was posted in Uncategorized and tagged day, life, mom on April 28, 2014 by Becca. Easter has come and gone, and along with it went Lent. This means that we can watch TV again. I thought that giving up television would be very difficult and that I would be bored each night. At the beginning, I was quite bored. I would just sit on the couch and wonder what I should do next. After a few weeks I got used to it and began to enjoy it. Instead of watching television and drinking a margarita while eating popcorn, I began to read and drink a glass of wine. (my drinking actually declined quite a bit during this experiment….not that I drank all that much to begin with). First, I finally finished the book “The Paris Wife”. I had started reading it a few months ago and could never find the time nor the energy to read it. I finally finished reading it (although I did skip the last twenty pages or so and jumped straight into the Epilogue…it was about Hemingway…I already knew how he ended up.) Then my friend, Sidney, gave me the first two Hunger Games books. I read both of them in less than two weeks and am now reading the third one. They are an easy read, enjoyable and page turners….the perfect recipe for night time reading. I have been so obsessed with these books that I haven’t written a blog post for over a week! After Easter I tried to watch TV one night, but was not interested at all. I turned on Netflix, picked a show that I usually enjoy (Everything is Sunny in Philadelphia), watched less than five minutes, and then shut it off. I was truly not interested in watching TV. I picked up my book instead. They say that it takes two weeks to create a new habit. For me it took a few more weeks than that, but once I found what I enjoyed the transition was easy to make. Now, this has not been the same wonderful experience for the kids, especially Wilson. Wilson loves his TV. He has been counting down the days since we started this TV fast. He got to watch a show or two at my mom’s house each week, but for him it wasn’t enough. We decided to have a movie-night on Easter Sunday evening to kick of the new TV watching. Weeks ago, the kids had picked out the movie that they wanted to watch: Tinkerbell’s “Fairies and Pirates” movie. We had popcorn and a carpet picnic during the movie….I didn’t even have to cook dinner! Unfortunately, Wilson is now asking to watch television all of the time!! It is driving me nuts! We made the rule that they get to watch television on Saturday mornings and one movie night per week. Wilson still begs for it all the time. He did wear me down the other day while I was cooking dinner. Everyone was being very whiny and annoying and it was difficult for me to do anything in the kitchen. i decided that they could watch one show. Sometimes, the TV is a great babysitter and a great distraction. One show can reset everyone’s attitude for the rest of the night. I am hoping to stick to my guns most other days. i am sure Wilson will quit asking after a while….I hope. I never thought that I could live without watching a little bit of tv each night, even though I knew that there was nothing morally uplifting on it. Some one once said that we should gauge what we watch through the eyes of Jesus….would we watch it if He were sitting next to us on the couch? I have to admit that most of the shows that we watch are full of adultery, sexual immorality, murder, profane language, and a host of other unbecoming behaviors….and we don’t even watch the worst of the worst. I felt that we were watching some of the better shows, but deep down knew that we weren’t. I guess I will have to stick to Survivor for now, until I can find something that is morally uplifting. Overall, this was a fabulous was to break old habits and start new ones. Sometimes it is best to shock the system in order to change things for the better. We all detoxed from television over the past six weeks. It was the best thing that our family could have done at the time. We played games, stayed outside longer, had more dance parties, played Monster, slept more, and read more books. I would do it again in a heart beat. This entry was posted in Uncategorized and tagged lent, over, tv on April 25, 2014 by Becca. I read an article a few weeks ago about a playground in Great Britain that looked more like a junkyard than a playground. It had old mattresses, crates, wooden pallets, a walker for elderly people, and fire pits in it. The philosophy behind this playground is that it is there to help children use their imaginations, overcome fears, and learn life lessons about cause and effect. It is called “The Land.” The article went on to say that the playgrounds in America have gotten stale and boring due to a slew of lawsuits that occurred in the late eighties and nineties. It also stated that parents now hover over their kids, never letting them out of their sights for fear that they will get hurt or kidnapped. These are real fears, but they are hindering our children’s independence and ability to grow up normally. I can honestly say that I totally agree with this article, even though I am guilty of some of its findings. After reading the article, I better understood the reason why my kids do some of the things that they do. I also decided that I needed to change the way some things were done around my house. The next day, I went out into the front yard and trimmed back the hedges along the front of the house. Now, when I say I “trimmed them back” I don’t mean that I trimmed the front of the bush. No, I trimmed out the back of the bush next to the house so that the kids could have a secret place to play while outside. Kind of like a fort. I then started to let them play in the front yard without me watching them the whole time. They are smart enough not to go into the street – that is not the problem. The problem was me living in fear of them being snatched up by a stranger. I have taught them a bit of “stranger danger” and have to trust that God has them under his protection and that they have listened to what I have told them. They aren’t out there for hours unattended, but they are out there for ten to twenty minutes while I prepare dinner. Kids do need to be supervised, but they can still play outside or walk one block home from the bus stop (which kids in my relatively safe neighborhood do not do). Now, as for explaining why they do the things that they do, that was easy. My kids never play with their toys. We could get rid of all of them and they would not even notice. They play with the dress up clothes, bikes, roller skates, balls, microphones and instruments…that is all. One of their favorite things to do is to roll up the large area rug in the living room, push it long ways down the stairs and turn it into a slide. Seriously!! They also enjoy taking all of the cushions off the couch building a great big pile with them. The rope that they found a week ago has gotten lots of use as well. Today we went to the playground with my friend Erin and her two kids. We ordered pizza and hoped to stay at the playground for a few hours around dinner time. Unfortunately, it started to drizzle as soon as we sat down. You would think that we would have left….nope, we didn’t. The kids played in the rain on the soccer field in 50 degree weather. Not once did they complain or go onto the playground equipment. They kicked dirt on the baseball field and then started pulling big logs and throwing sticks into a big pile. They loved it! We were there for over an hour, sitting in the rain, and watching the kids have a great time just being kids. That is why Erin and I are friends, we are both laid back enough to almost feel guilty for not leaving when it started to rain, but smart enough to know that if the kids are having fun, then don’t rock the boat! All of this to say that kids need to be kids. We have to let them have fun and not be so worried about injury, dirt, or messes. They also don’t need to be showered with toys because most likely, they won’t play with them anyway. I have decided to end this post with one of my new favorite pictures which completely encompasses everything I have just said about letting kids have some good old fashion, dirty fun! 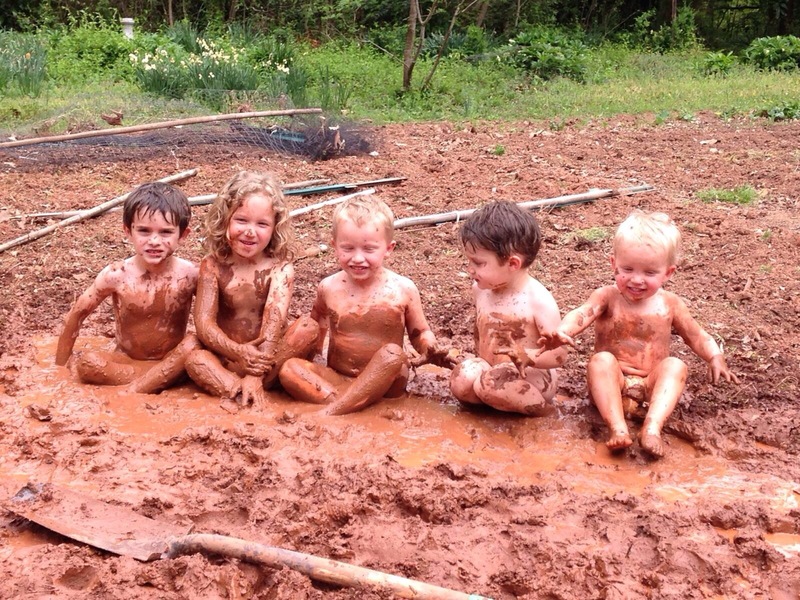 This picture was taken at my mom’s house just after they tilled up the garden and then watered the dirt. This also happens when you leave DaDa (Steve) in charge of the kids. Again, good old fashion fun! This entry was posted in Uncategorized and tagged mud, outside, picture, Play, toys on April 18, 2014 by Becca. 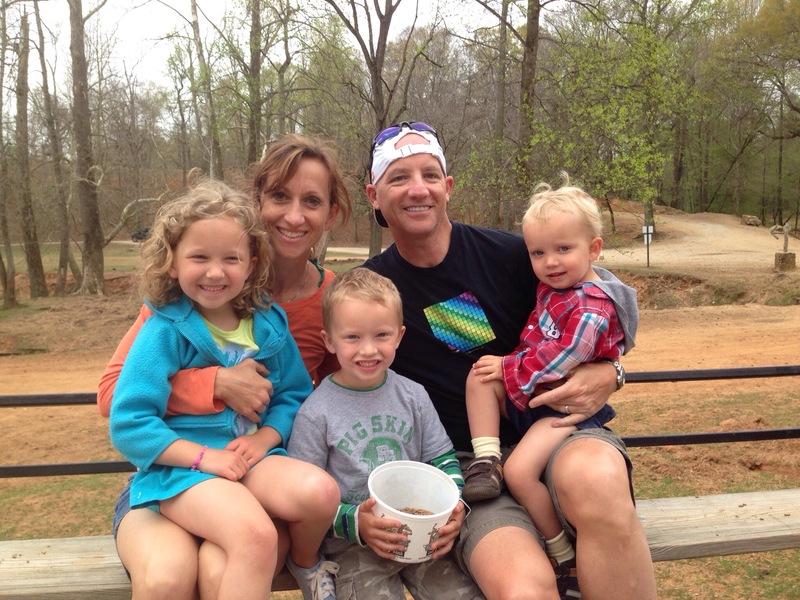 Spring Break has begun and we wanted to start it off right with a fun, family day trip. 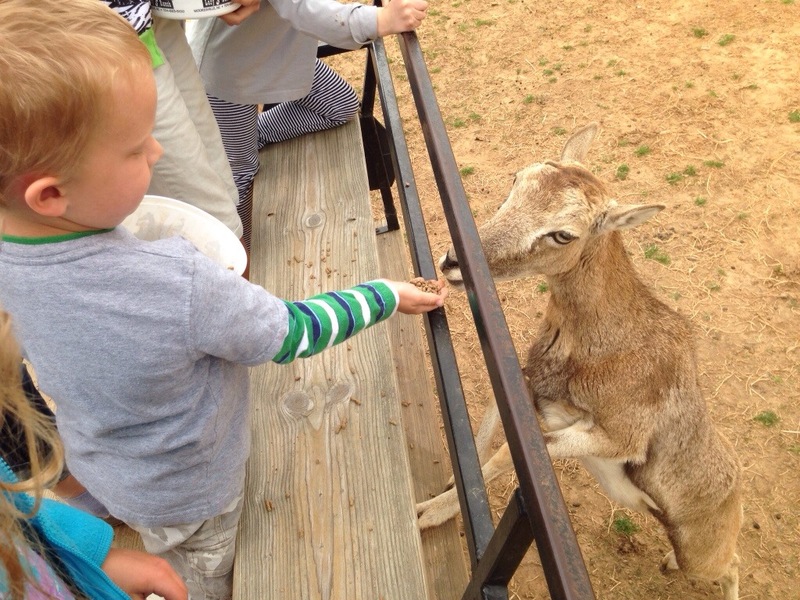 We went up to Moorsville to the Lazy Five Ranch – an animal reserve/zoo where we could see, touch and feed the animals up close. It was so much fun! I enjoyed it as much as the kids. We payed a little extra to ride on the horse drawn wagon through the park. We were given many buckets of animal feed on our open air wagon. The animals came right up to the wagon. Some even stuck their noses under our seats to get at the buckets. Wilson was not scared at all. He fed deer, Brama bulls, a zebra, goats, water buffalo, bison, and many, many other wild animals that you don’t get to see up close. Faith sat in the middle of the wagon – she is afraid of most animals, but enjoyed looking at them all. 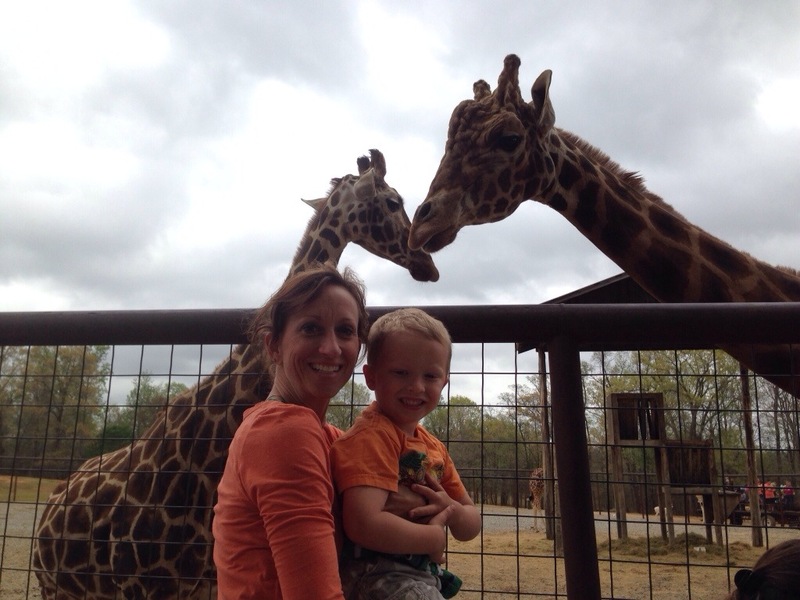 One of our favorite parts was feeding the giraffes. They put their long necks down over the fence and ate from our bucket. Very cool…. 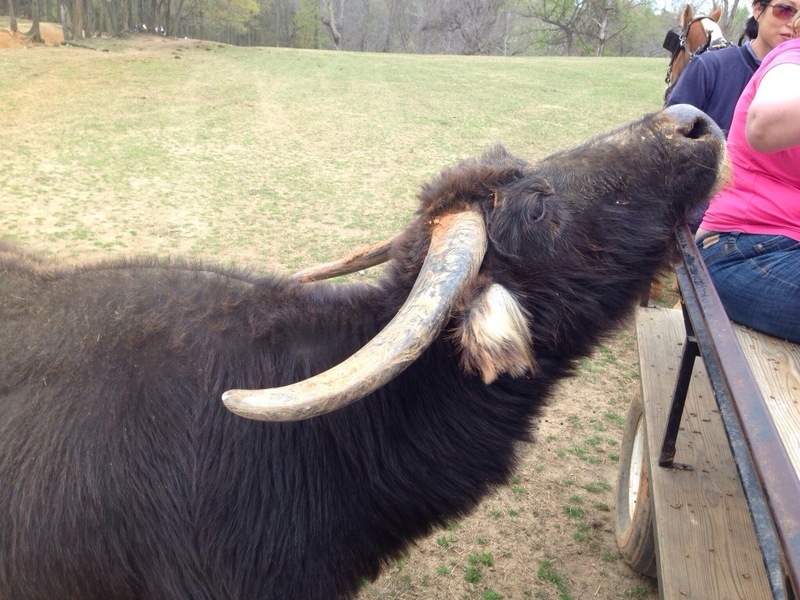 Here is how up close and personal we got with some of the animals…. After the hour long wagon ride we went to the picnic area to eat lunch and play on the playground. The kids loved the playground that looked like a wooden ship. There was also another animal area where we could pet goats and camels and see many exotic birds. A peacock roamed the parking lot. We were there almost three hours and could have stayed longer. It was a great family adventure. We will definitely be going back to the Lazy 5 for many years to come. This entry was posted in Uncategorized and tagged family, five, lazy, ranch, trip on April 17, 2014 by Becca. Every year April hosts the neighborhood egg hunt. There are more and more children moving into our neighborhood each year. We are blessed to live in neighborhood that hosts so many parties and get togethers each year. For the kids, the egg hunt and the Halloween party are the two biggies. It was a smaller group this year, but that just meant more candy for those that were there. 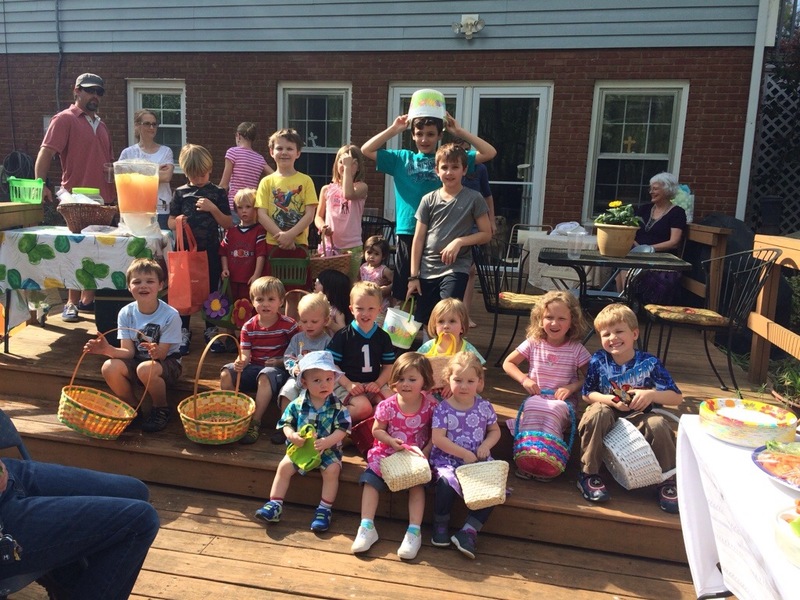 Here is everyone before the festivities begin…..
At one point I had to stop Wilson from gathering too many eggs. He is still in the “under 5” age group which meant that he could run around and scoop them all up before the little ones even knew what happened! And I, being the health nut that I am, was cringing with each egg that he opened and gobbled up. He thought it was funny to open egg, call my name, show me what he was eating and pop it in his mouth. I decided that it was time to leave when Miller got lemonade spilled all over his clothes and I had to strip him down to his diaper and Wilson started crying because he got hurt. Luckily a neighbor offered to drive us home so that we didn’t have to walk. 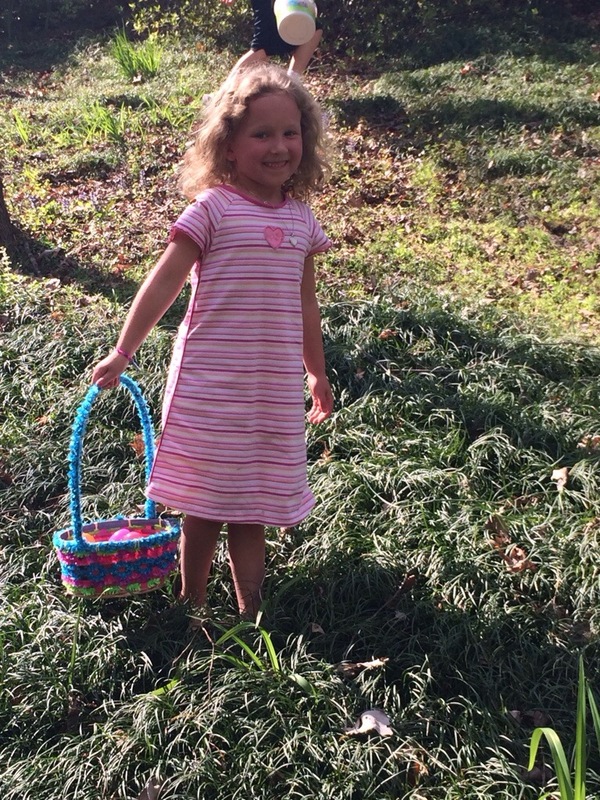 Here is some pictures at the END of the hunt….. 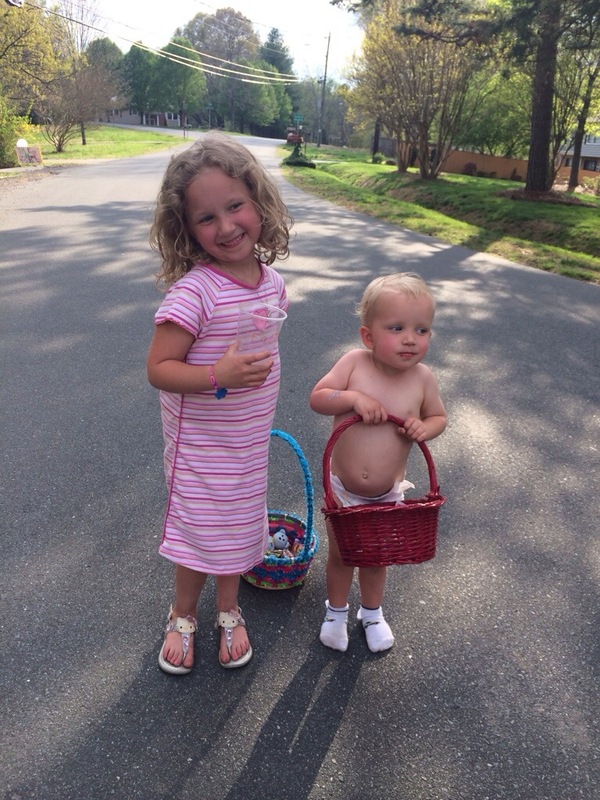 This entry was posted in Uncategorized and tagged april, Easter, egg, hunt on April 14, 2014 by Becca. Tom ran in the White Lake half Ironman again this year. Last year we took the whole family, stayed two nights and rented a cabin. 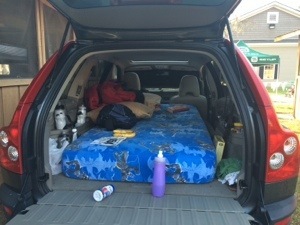 This year we went alone, stayed one night and slept in the car. It was very easy and very enjoyable! Tom and I drove down on Friday afternoon and arrived around 4:00pm. That have us plenty of time to scope out the set up and relax a little by the lake. We even got to go out to dinner and sit at the bar to eat. Most of the time when we go out to dinner we end up sitting at the bar. We both really enjoy sitting there. It is fun…and maybe it even reminds us of our younger days. After dinner we went back to the race site, pulled the car up next to the cabins that we rented last year, and set up camp. No one noticed nor did they care. We slept in the back of the Volvo on one of Wilson’s mattresses from the bunk bed. Believe it or not, it was quite comfortable and cozy…even though it was half the size of our normal bed. 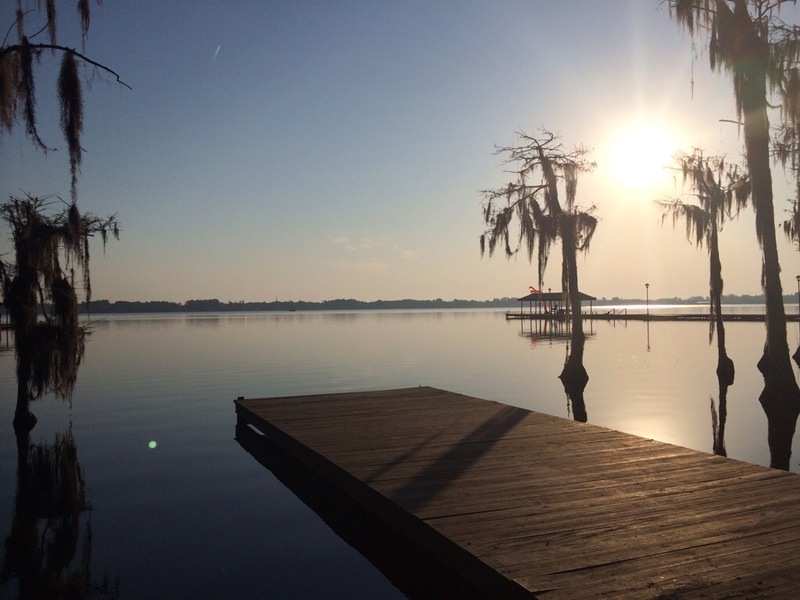 When we woke up the next morning, I rolled out of the car and was able to enjoy this beautiful view…. That is the lake that Tom swam in during the race. Lucky for him, the water was 15 degrees warmer this year…about 70 degrees. Tom did well in the race. He beat his time from last year by 15 minutes (5hrs. 45 min). He came in 5th out of 30 in his age group. He worked very hard to accomplish this and I give my “hats of to him”. Better him than me! As we were driving away I realized that we didn’t get a picture of us by the lake as planned so we took a selfie in the parking lot. At least I tried…. 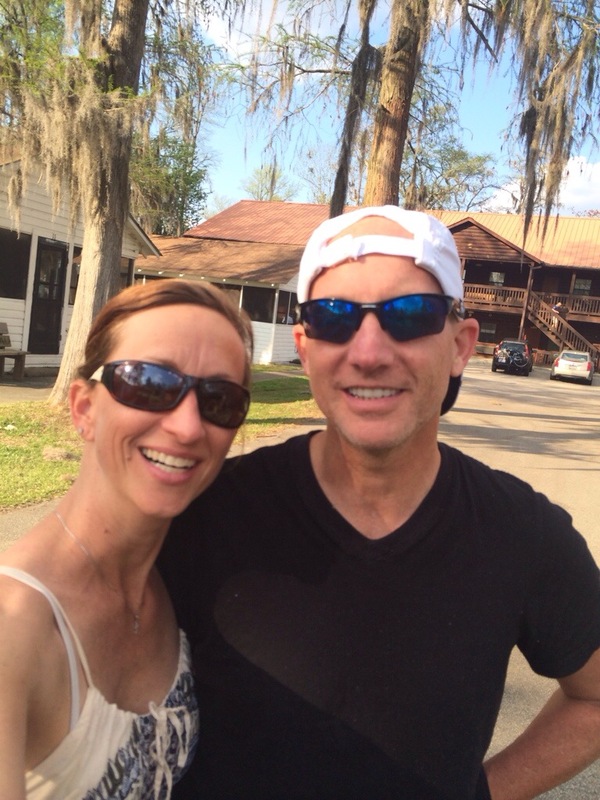 This entry was posted in Uncategorized and tagged half, Ironman, white lake on April 13, 2014 by Becca.